Should we be more like AFC Wimbledon? Discuss. 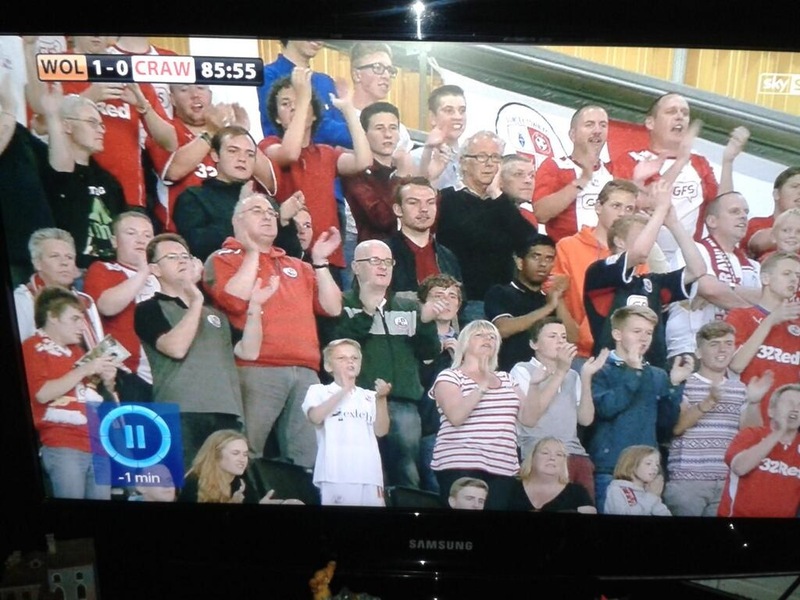 If you’re in this picture, we can confirm conclusively that you weren’t watching the game on Sky….! Friday night. 10 PM. The Black Country. A number of slightly sad but rather proud Reds supporters are thinking about what might have been, having watched their team play wealthy Wolverhampton Wanderers off the park in front of 17000 of their own fans, only to lose to an added time penalty. Messages start to flood in on Twitter, Facebook and phone, all with a common theme- how impressive Crawley Town have looked to the watching Sky Sports millions. Now all of this is great- the team gave us greater exposure than even half a dozen marketing managers could ever have hoped for-but there was a second common theme. Many of the messages came from people who live in or near our town but never visit the Broadfield. For me, that is much sadder than any last minute loss. At the Fans Forum last Monday our new Chief Executive, Michael Dunford, alongside Manager Richie Barker, made a number of statements. For me, the most telling were one that received lots of coverage, and one which went almost unremarked. The former, a transfer embargo over the summer caused by a minor breach of the Football League Financial Fair Play Rules (or Salary Cost Management Protocol to use the correct title) which left us a little stretched on the squad front, has been subject to many column inches (and much debate on CTFC.Net), and is a clear demonstration of just how tight our margins are. We hardly have a large squad, though I suppose it may be argued (fairly) that we should be happy with quality over quantity. The statement less remarked upon, however, was the claim by the CEO that the owners had “taken a gamble” over the past couple of seasons. What did he mean? It doesn’t take a genius (obviously, if I’ve worked it out) to comprehend that League One football is expensive, and that crowds of three to three and a half thousand will not only leave us with very little money to spend on player wages but also with which to run the club. Even though our promotions department seem to be punching above their weight, we don’t own our own ground, we get no secondary income from it or from its environs (apart from occasional events in Redz or the Executive Suite), and the streets of Crawley are hardly thronged with people wearing our replica shirts or clutching cuddly devils (or meerkats- you see, I for one have visited the club shop). The gamble, then, is obvious. The owners are underwriting a great deal of the running costs of our club. They are “gambling” their own money. Now we have every reason to be grateful to those who own our football club. Very few people make enormous amounts of money from such a position, and those involved in CTFC are certainly no exception to that. As supporters we’ve enjoyed the benefit of their largess; indeed, many of the most joyous moments of my life have been made possible by this generosity. But if the future of our football club depends on a gamble, I can’t help but worry- you’d be as likely to make a profit in a Vegas casino as in League One. Our owners are nice people. Hard working. Generous, obviously. But not one of them is Roman Abramovich. We need to think about that when we’re enjoying Molineux, Bramall Lane and Ashton Gate- or staring at the goggle box from the comfort of our armchair. Sooner or later we’re going to have to become self sufficient. Our primary income comes from bums on seats and feet on terraces. Unless we can build a future as the “Crewe Alexandra of Sussex” and develop lots of players to then sell for millions of pounds to Manchester United et al, that primary income source is unlikely to change (and the latter option is hardly a business plan anyway). Three to three and a half thousand pairs of feet (or bum cheeks) isn’t enough to be sustainable at our level. So how do we increase those numbers? For me, we have three options; spend more money on the team to grow crowds through increased success, improve our marketing, and improve our relationships with our community. The first of these is not really an option. Indeed it is no more than a gamble at any level. My “second” club has always been Leeds United, and I recall, as Leeds were going bust, a certain Mr Risdale commenting that we’d “lived the dream.” Dream? If we’d known, as supporters, that we were spending unsustainably, it would have been no more than a nightmare. It certainly became one. The second and third- marketing and relationships- go together, are much cheaper to achieve, and with a little imagination and some supporter input could be key to future success. Yes, we love our football club. Great; we all have an emotional connection to CTFC, that’s a good place to start. But that does little more than drive us to attend. We need, in turn, to be driving other people to attend, then helping that to become a habit. We need to be part of the “attraction strategy.” As I’ve said before, we need to act as 3000 marketing managers. For that to become feasible, we need a far greater involvement than just turning up on a Saturday afternoon and handing over twenty quid. But in the main we don’t have that involvement, we have simply a customer/supplier relationship. CTFC supply our football fix. We pay for it. There it ends. AFC Wimbledon- sorry for using that kind of language without prior warning- averaged 4100 last season against our 3400, despite flirting until the very last day with a return to the Conference, or whatever it’s called this week. Not only do they have better crowds, they have a large number of volunteers, matchday and otherwise. Why, as one of the CTFC owners has asked me in the past, does Crawley Town not have such a volunteer army? Well I would suggest that one of the chief reasons for the engagement of AFC fans is that they OWN their football club. Their involvement with their club is more than emotional, it is also financial. Their relationship with the owners of their football club is exceptional because the ARE the owners. They have a stake in the success of AFC Wimbledon that goes much further than just turning up on a Saturday afternoon. If you are a member of the CTSA you are much more than a number. You are a shareholder, and as long as you continue to be a member you will continue to hold that share. Now we don’t issue share certificates anymore because of the cost involved (though we will if you want us to, it’s your money after all), but in essence you are the part owner of a limited company just by paying your membership fee and signing a form. Does that make you more committed to the CTSA? Probably not. For most of you membership is just a nice thing to have and offers access to a collection of benefits. But would you feel the same if the CTSA had a financial stake in the football club? If you, in essence, were a part owner of the football club? Suddenly it all becomes rather more serious. Now I’m not, for one moment, suggesting that the CTSA wants to own Crawley Town. Look around you- most if not all Trust Owned clubs ended up that way because it was the only way to keep their club in existence. We are not in that position, and I hope to God that it never, ever becomes necessary. But would I like the CTSA to have a financial stake in the club- absolutely, and for all of the reasons I’ve outlined above – plus one additional reason. It is not a secret that the current owners would like to sell the club and/or bring in new investors. To be attractive to investors in the current marketplace and at our level the need to have an effective relationship with the community is critical. What better way to demonstrate the strength of that relationship than by the community, through the CTSA, owning a share of the club? I have already informally asked the board how they would feel about the CTSA as investors. I will ask formally if you, our membership, feel that it is what we should be doing. I can’t promise that the club will be comfortable with the prospect, but I think I’ve highlighted the benefits. Looking beyond that to the question of relationships between the club and the supporters, I’d also like to take the opportunity to introduce you to the role of the Supporter Liaison Officer. UEFA actively encourage all clubs to have one of these, usually a paid employee, and the role is seen as critical in many countries, with Germany (as usual) ahead of the game on most levels. What does a Supporter Liaison Officer do? Simply, brings the fans concerns to the club and the clubs concerns to the fans. Liaison with the police can also be involved, as can a role with the press, etc. Now I’m not suggesting for one moment that CTFC add someone to the payroll given the points I’ve already made about financial sustainability, but given the importance of customer relationships to our future success and the need for these relationships to be meaningful and involve two way communication, the role takes on a significance which shouldn’t be underestimated. The CTSA see this as a role we should be undertaking, and indeed this level of communication was part of our aims at inception, but currently we do it informally. Perhaps this part of our relationship needs to be formalised and we all need to take it rather more seriously? Perhaps that would help avoid damaging club/community relations when bad news has to be delivered, for example in relation to the recent closing of the academy and last seasons concerns about “searching?” It is impossible to please all the people all of the time, but effective liaison and communication will not only help build relationships but also help stop them from being eroded. Working together, the CTSA and the club do have an opportunity to achieve this; and if we can get the relationships right, attracting people, keeping them, and persuading them to attract others becomes far easier. As Elvis may have put it were he from Crawley, “we can’t go on together with Suspicious Minds.” Trust is key. On many levels. Well, you’ve read my views. Now, what are yours? Have I hit the nail on the head, or have I missed the target like a John Akinde penalty? Let me know what you think. Let me have your ideas about how the club could best attract support; indeed, on any of the issues contained within this piece. But please, don’t sit on your hands- or in your armchair- and expect somebody else to ensure the future of your football club. We next play at home to Gillingham on September 7th- and I hope to see you there. Please bring a friend! It may not be as comfortable as watching the Premier League from your living room but I can promise that it’s much more entertaining and that you will be making a positive difference.